Once upon a time there was a Giant who was so big that he could see across the highest mountain of the country. One day the Giant meets a girl that is very small. 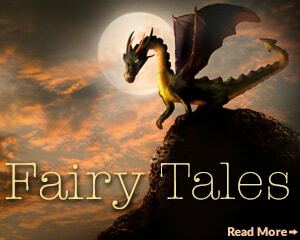 No, not as small as Tom Thumb in the fairy tale but she is not that much taller. The Giant and the little girl burst of laughing. “Say, Giant, what can you do what I cannot do?” asks the girl. “I can run very fast,“ answers the Giant. “But, not as fast as I can,” says the girl. “Oh, no, I will show you,” says the Giant and he prepares to take an enormous step of one mile. Because she is so tiny, the Giant does not notice that she grabs the lace of his shoe. Just before he puts down his foot, the girl let go the lace and lands just in front of the Giant. 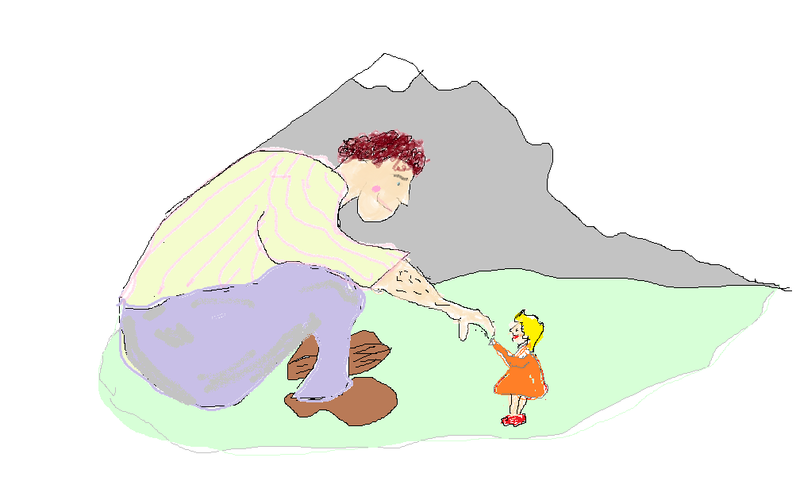 “What took you so long?” asks the girl to the Giant, who cannot believe his eyes that she is standing in front of him. “Are you the same girl as before or are you her twin sister?” he stammers. “Are you sure you can do something better than me? “ the girl asks. “All right, go ahead and tell me what you have seen,” replies the girl. “I will first put on my hat because the sun shines into my eyes,” says the Giant. The girl is standing next to the Giants big hat. Just before he picks it up to put it on his head, she quickly holds herself at the edge of the hat. On top of the Giants head she can look behind the mountains. Far away she can see the blue sea with a white lighthouse. On the water lays a red painted ship with brown sails. She hears the Giant sigh and when she sees his big hand reaching towards his hat, she firmly holds the edge. Fortunately, the Giant puts his hat gently down on a chair. He does not notice how the girl slides down a leg of the chair. “Where are you gone?” asks the Giant, who looks around to find the girl. The Giants eyes open wide. He now raises his eye brows. The Giants mouth falls open in surprise. “That is impossible. This is witchcraft,” he babbles. The Giant can’t believe his ears. “How can this be, this is impossible,” he says desperately. “Oh, yes, please tell me how this works,” begs the Giant.